One season does not define a program, an era or a coaching tenure. For Florida State head coach Willie Taggart, that’s very good news. As most know by now, FSU watched its 41-year streak of winning seasons, NCAA-record 36-year streak of bowl appearances and 5-game winning streak over Florida all come to an end one week ago with a 41-14 loss to the rival Gators. To say the 2018 campaign was a disappointment would be putting it mildly. The first season was nothing short of an absolute disaster. Coming into the year, Taggart had built up a lot of goodwill with the fan base and a lot of hype. At 7-6 in 2017, the Seminoles were coming off their worst season in eight years and needed to win their final three regular season games, including a rescheduled contest with Louisiana-Monroe, to become bowl-eligible. Entering the season, few expected FSU to dethrone Clemson as ACC champions or to compete for a national title, but a better season than 2017 seemed like a given. Instead, FSU got worse and in more ways than just the final record. The Seminoles may have finished 7-6 in 2017, but with the exception of an embarrassing loss at Boston College, were typically competitive. FSU trailed eventual national champ Alabama by just three late in the third quarter, lost by six to NC State, in the final seconds to Miami and Louisville and were within three at Clemson the final period. In losses this season, FSU rarely put up a fight. The average margin of defeat was greater than 24 points and that includes a 1-point loss to Miami in which the Seminoles let a 20-point second-half lead slip away — the largest in program history. Erase that loss from the docket and the average margin of defeat is 28 points. Six of the seven losses were decided by at least 19 points. Unlike in 2017 where FSU posted a top-25 defense, there was really no aspect for the 2018 version that was a positive. The Seminoles were held to 14 points or fewer in five of 12 games — the most since 1981. In addition to dismal special teams, FSU allowed more than 31 points per game — the most in school history. FSU allowed at least 41 points in each of its final four losses. Florida State had never before allowed four different opponents to eclipse the 40-point mark in one season. While the Seminoles finished one win shy of bowl-eligibility, they were probably three plays away from being 2-10. FSU needed fourth-quarter rallies in the final five minutes to beat Samford, Louisville and Boston College. The Eagles, at the time, were ranked and served as FSU’s best win of the season. Samford is an FCS school that finished 6-5 while Louisville was just 2-10 and winless in ACC play. Without an inexplicable decision to throw on first down with less than two minutes to play by Louisville, followed by a 58-yard touchdown pass from Deondre Francois to Nyqwan Murray, FSU probably loses that one. On top of that, Florida State was the most penalized team in the country. Even through the latter parts of the season, FSU struggled to line up properly on offense and defensively, blew coverages far too often and committed crucial mistakes that kept opposing drives alive. The simplicity promised by Taggart in the offseason was far more mental than lethal. On the positive side, there were some youngsters on the roster like Tamorrion Terry, Tre’Shaun Harrison, Keyshawn Helton, Brady Scott, Jaiden Woodbey and Asante Samuel Jr., who showed serious upside this season and should be cornerstones of the program moving forward. Aside from those players and Taggart’s ability to recruit — which is a significant matter — nothing else from 2018 instills much optimism moving forward. As far as Taggart is concerned, he has traditionally been a slow starter when taking over programs before ultimately turning them around. It should be noted that this was the first program that he inherited that had a winning season the year prior. In fairness, he also inherited a program that was thin and underdeveloped at key positions such as the offensive line and linebacker. What’s problematic for Taggart is that his now arch-rival Florida was also breaking in a first-year head coach in Dan Mullen. The Gators appear bound for a New Year’s Six bowl in hopes of getting to 10 wins while FSU is sitting home for bowl season for the first time in almost four decades. Nationally, it was a mixed bag across the spectrum for coaches in their first season. Others such as Taggart’s predecessor and Texas A&M head coach Jimbo Fisher and his successor at Oregon in Mario Cristobal elevated their programs’ regular season win totals while UCF’s Josh Heupel has kept the American Athletic Conference dominance going. In other cases, UCLA’s Chip Kelly, who coached in a national championship and the NFL and Arkansas’ Chad Morris watched their programs take even steeper declines. Other such as Arizona State’s Herm Edwards, Mississippi State’s Joe Moorhead, Tennessee’s Jeremy Pruitt and Nebraska’s Scott Frost kept the status quo. It is worth noting that the Cornhuskers showed immense improvement as the season went on under Frost. It is fair to say that FSU faded down the stretch. Slow starts to coaching tenures aren’t uncommon, even for great coaches. In 2007, Nick Saban came to Alabama and needed to win a bowl just to clinch a winning season at 7-6. That year, Saban’s Crimson Tide lost to the likes of Louisiana-Monroe. The next year, they went undefeated during the regular season before falling to eventual national champion Florida in the SEC Championship. In the last nine years, Saban’s teams have claimed five national championships. 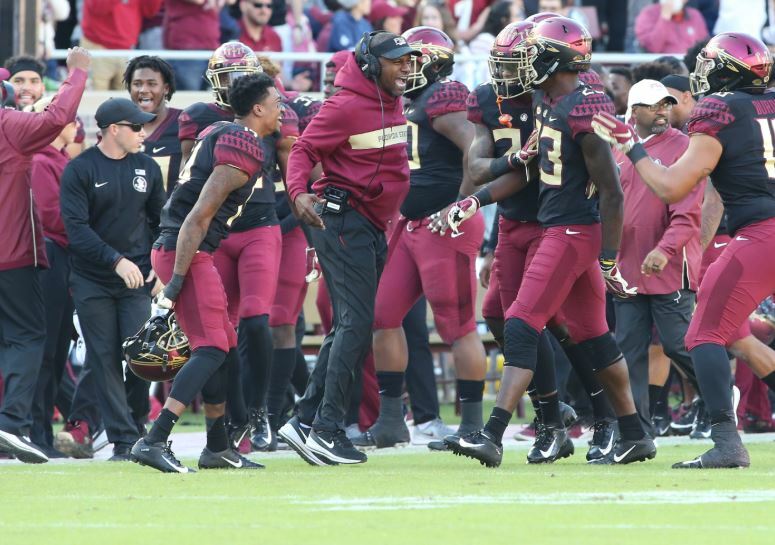 None of this is to say that Taggart’s Florida State program will be the next college football dynasty, but one season is not enough time to draw any significant conclusions. Washington State’s Mike Leach went a combined 12-25 in his first three seasons in Pullman and just coached the Cougars to their first 10-win season in 15 years. LSU’s Ed Orgeron had a career losing record as a head coach when he was promoted at LSU and has the Tigers likely bound for a New Year’s Six bowl. While neither of the last two names will probably fill FSU fans with overwhelming joy, the point is that the verdict is still out on Taggart. There’s no reason not to believe that Florida State will again be a football force to be reckoned with in the not-too-distant future. The only question is whether Willie Taggart is the guy to take it there.